"Help, I need a wedding entertainer!" In that case, why not hire Mr Sketchum? What better than to immortalise those that you cherish with quality amusing portraits - and even perhaps even those you're not quite so keen on! 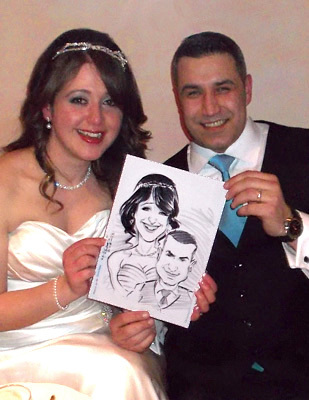 I work as a professional wedding entertainer and caricaturist. The pattern tends to be that I start just after the ceremony during the drinks reception, as guests loosen up and begin to hobnob. caricatures to the tables of delighted diners as I go along. It�s usual that a number of guests from the two families will have never met; my caricatures give them - and everyone else - an amusing subject of conversation to share in. After the wedding breakfast is finished and formalities are over with guests can let their hair (if unlike me they have any) down, and enter into a somewhat more relaxed frame of mind ~ my informal and "quirky" wedding entertainment fits the situation perfectly. I sketch the happy couple during any convenient break in proceedings. If required I also ensure certain wedding party members of your choosing have their caricatures sketched, or concentrate on the top table. Booking me guarantees you jolly social interaction, excellent drawings, gifts unique to the recipients, memories that will last a lifetime, and of course lots of side-splitting laughter. "Hi Alfie, I just wanted to drop you a line to say thank you so much for coming to our wedding and making it so special. Our guests were thoroughly surprised and had wonderful treasures to take away to remember the day. I hope you enjoyed it as much as we did. If you wish to use this as a testimonial for your caricature website, please do so, I would thoroughly recommend you as a wedding caricaturist again and again! Take care and I hope to see you again in the future." "Mr Sketchum performed at our wedding reception. His drawings, along with his sense of humour, went down a storm! He was a fantastic addition to our reception and we're very happy that we booked him. He got along with everyone so well that some of our guests thought that he was a friend of ours! We would thoroughly recommend Mr Sketchum for any wedding or party." From small and intimate gatherings to lavish luxury celebrations, I've enjoyed consistently making wedding couples' special day that bit more special, and ensured that your event is one which you and your guests will remember. Over the years I've enjoyed entertaining at literally hundreds of wedding and wedding-related affairs. As well as the classic type, I've sketched at Hindu weddings, African weddings, civil partnerships, post-wedding & honeymoon parties, wedding anniversaries, hen nights (never done a stag night - yet? ), engagement parties, christening parties...even Essex Weddings...! It's something different, which is an advantage, as guests readily take to the novelty value and humour. It's also one of the refreshingly alternative London wedding entertainment ideas that has always gone down well with guests of all ages - and persuasions! Mr Sketchum is a stage name of course, Alfie Deliss being the real one. Hire me, and enjoy commissioning a well-established professional, with fourteen years of experience providing entertainment as a London & UK wedding caricaturist. Website contents regularly archived. Write your copy yourself. Text and Images Copyright � Alfie Deliss ~ London Caricaturist Mr Sketchum 2013. All rights reserved.